This 5W30 oil is designed for air-cooled engines operating in cold climates. 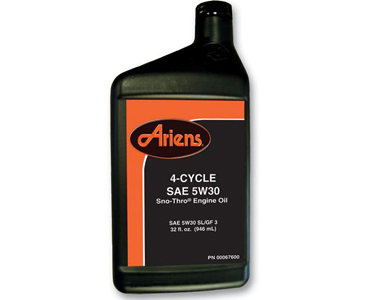 Ask us about the Ariens 5W-30 Snowblower Oil (32 oz.) 00067600. Please no repair questions. Your Q&A may be posted to SnowblowersAtJacks.com to help other shoppers, like you, with their purchasing decisions. Thank you. Kevin,current Sno-Tek models, such as the Ariens Sno-Tek 24, have a 16oz oil capacity. If you have an older model, please refer to an owner's manual or provide us the model number as a reference.